It's still cold - so of course, we're still looking at summer weddings. We love a classic NYC wedding and Julia and Vlad's big day was just that! 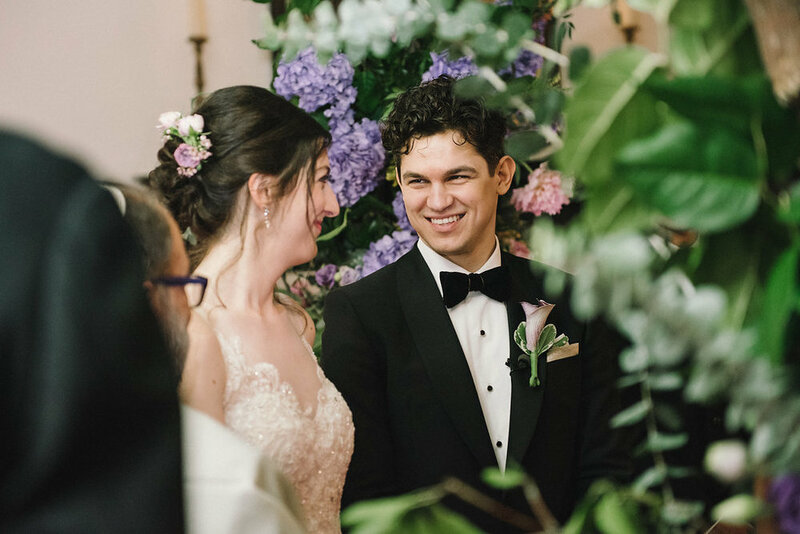 They brought their Brooklyn-vintage aesthetic to The Yale Club and the result was the feeling that an outside summer garden had been brought inside! Garden Wedding Invitations. Photo by Sasithon Photography. The bridesmaids were dreamy in mixed gold metallic. Their bouquets by Atlas Floral Decorators were the perfect blend of the purple, yellow, and green hues of their palette - with just a hint of pink! Mixed metallic bridesmaid dresses and organic bouquets. Photo by Sasithon Photography. Everything took place at The Yale Club, starting with the ceremony. We're kind of obsessed with the ceiling at the Yale Club - it's anything but boring! Ceiling details! Photo by Sasithon Photography. Julia and Vlad were all smiles while they said their vows. 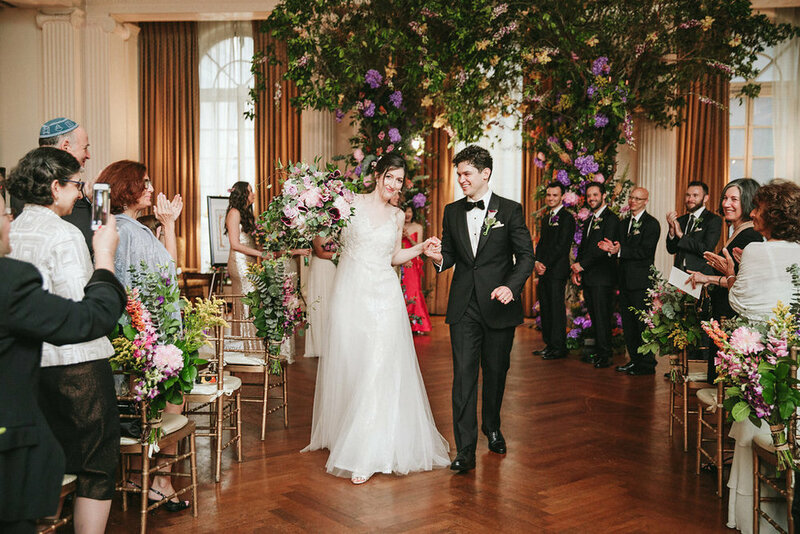 Their chuppah was made up of lush, tall trees woven together by summer florals. Up close, it looked like they were getting married in a forest! Forest wedding chuppah. Photo by Sasithon Photography. After getting hitched, our team flipped the ceremony room to get it ready for dancing while guests headed to cocktails. The magic forest vibes continued and were complemented by modern touches, such as gold geometric vessels for the flowers. Old world meets modern touches. Photo by Sasithon Photography. Geometric table runner. Photo by Sasithon Photography. Guests re-entered the room and after the first dance, 45 Riots took it away and had a packed dance floor! Julia has a bit of a sweet tooth, so later in the evening, not only was there a scrumptious cake, but she also had an incredible donut display with all of her favorite donut flavors! Wedding donuts from Peter Pan Bakery. Photo by Sasithon Photography. Ethereal forest-themed cake from Lulus Bakery. Photo by Sasithon Photography. Before we knew it, the night came to a close and these two lovebirds were MARRIED! MARRIED! Photo by Sasithon Photography. A huge thank you to the dream team of vendors who made Julia and Vlad's wedding come to life!